Billed as the “window to a magical marine world”, Monterey Bay Aquarium (www.montereybayaquarium.org) is home to an eclectic assortment of marine creatures, including sea otters, sharks, seahorses and the incredibly lovable African penguins. Perched on the edge of the Pacific ocean at the head of Cannery Row, this respected institution is more than just fun and games though, as it’s also a recognized leader in ocean conservation and education. Of course it goes without saying that no trip to the Northern California coast would be complete without a stop at this world class attraction. And the good news is, it’s an excellent choice for wheelchair-users and slow walkers. The down-side about the aquarium is that there’s no on-site parking. That said, there is a drop-off area in front, with benches located to the right on Hovden Way. The best accessible parking is located in the multi-level parking garage on Foam Street near Prescott Avenue. There’s elevator access to all levels, with accessible parking spaces located near the elevators. And at just $8 per day, the price is right too. From the garage, head west on Prescott Street and then turn left on the Monterey Bay Coastal Trail. It’s just a short level roll to the aquarium from there. Alternatively, if you find a vacant meter, you can park for free with an accessible placard or plate. 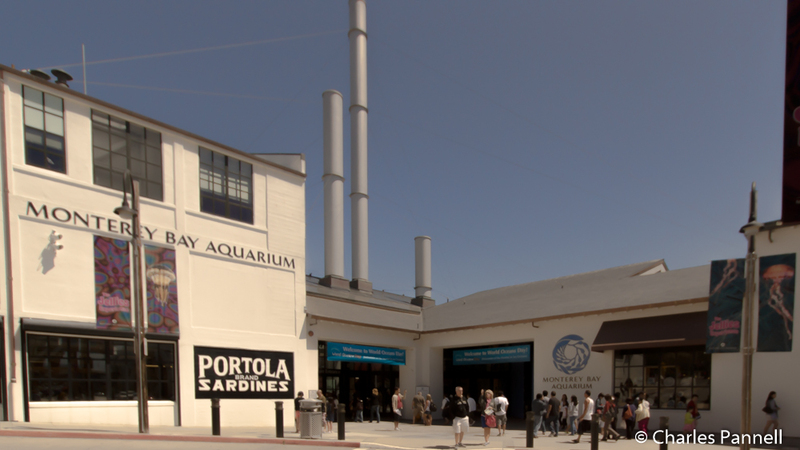 There’s level access to the aquarium entrance, plenty of room for a wheelchair to move around the exhibits, and accessible restrooms located on both floors. Although escalators lead up to the second floor, an elevator is also available. And if you need a little help getting around the expansive campus, free loaner wheelchairs are available at the Information Desk, next to the main entrance. 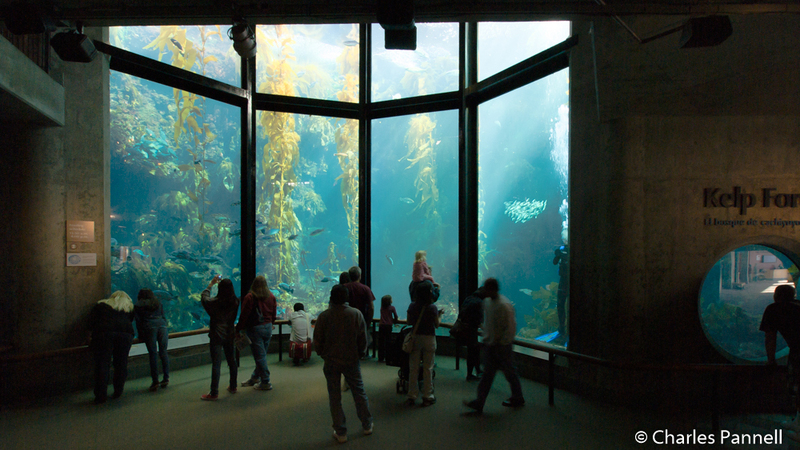 The Kelp Forest — a visitor favorite — is hard to miss, as this massive floor-to-ceiling tank is located front-and-center, near the main entrance. One of the tallest aquarium exhibits in the world, it’s filled with sardines, leopard sharks, wolf-eels and other creatures that weave in and out of the swaying kelp. And if you come at feeding time you’ll also find a diver inside the habitat. 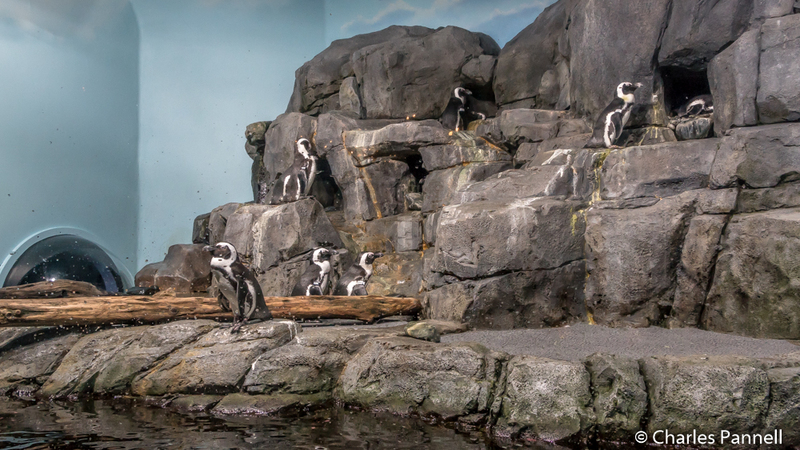 The African penguins on the second floor are also huge crowd-pleaser. How can you not like these petite tuxedo-clad flightless seabirds that scurry across the rocks and then plunge into the water and take a lap or two around their pool. And the exhibit is made so you can roll right up to the glass enclosure and even get a good look at the little guys when they dive. Don’t miss the adjacent Splash Zone either, which offers equally good access and provides a close look at some reef and shore inhabitants. After you’ve had your fill of cute with the penguins, head across the walkway to The Open Sea installation, which features jellies in low light, a tank full of sharks and sardines, and the equally cute tufted puffins. There’s good wheelchair access throughout the exhibit and the tanks are easily viewable from a wheelchair. Not only does this exhibit offer a window on life in the open ocean, but it also gives visitors an up-close-and-personal look at some of the more colorful deep sea inhabitants. There’s also a strong education component at the Monterey Bay Aquarium, evidenced by the long list of programs and feedings that take place daily. And the good news is, they are all included with the admission price. The excellent auditorium programs are presented nearly every hour. These educational presentations feature stunning videography and often include little known facts about some endangered species or vanishing habitats. There’s level access to the auditorium and wheelchair seating in back, so make sure and catch at least one of these programs during your visit. One of the most popular feeding sessions takes place in the one-million gallon tank in The Open Sea exhibit. Although you can see the feeding from the first floor, the second floor viewing area isn’t as crowded, so it’s a better choice for wheelchair-users and slow walkers. There’s elevator access up to the top and from there it’s a level roil over to the viewing area ,where you’ll see sharks and sardines dart about and grab morsels of food that are dropped into the top of the tank. Make sure and catch the sea otter feeding session too, as it also has a high cuteness factor. Again, the second floor is the better vantage point, as you can watch the sea otters swim on the surface. There’s a wheelchair lift next to the stairway to the upper gallery, but it’s best to get there early so you can get a spot close to the glass. This feeding session also serves as a training session, as the animals are taught specific behaviors by the aquarists, and subsequently rewarded for performing them on command. 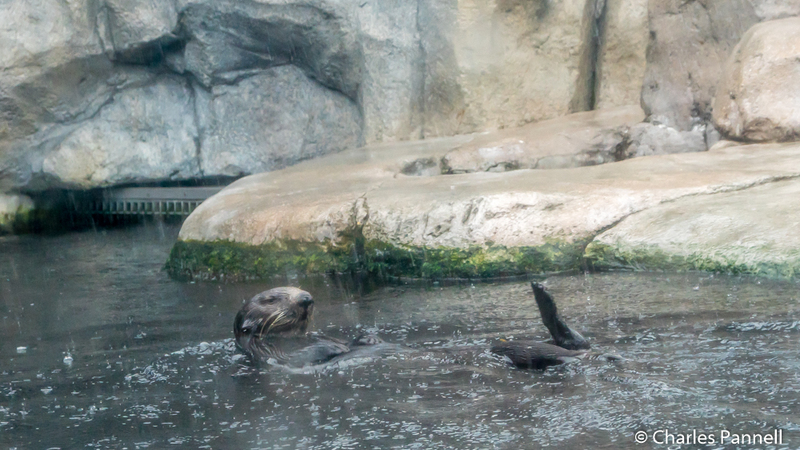 And if you’d like another view of sea otters, along with some sea lions and birds of the bay, there’s also level access to the outside deck where you can watch them in their natural environment. When it’s time to stop for a bite to eat, there’s a bevy of lunch choices at the Monterey Bay Aquarium. If you’d like a casual lunch in a cafeteria setting, then head on over to the Café. Offerings include soups, salads, sandwiches and pizza; and although it can get a little loud with the families and school groups, there’s plenty of room to maneuver a wheelchair through the dining area. Additionally, there are several tables reserved for wheelchair-users; and that designation seems to be respected by the rest of the clientele. It’s a nice spot for a quick bite. If on the other hand, you’d fancy a more relaxed venue, then check out Cindy’s Waterfront. Not only does this eatery offer good access and a nice bay view; but it includes a respectable wine list. Food-wise, they serve up a wide selection of seasonal favorites such as rockfish tacos, cioppino and even cod tostadas. And if you have little ones in tow, rest assured, they also have a kids menu. Of course, you can also do what the school kids do — pack along your own lunch. Although outside food is not allowed inside the aquarium, there’s level access to the outside seating area at the end of Hovden Way. Although it’s not the most glamorous alternative, it will save you a few bucks. 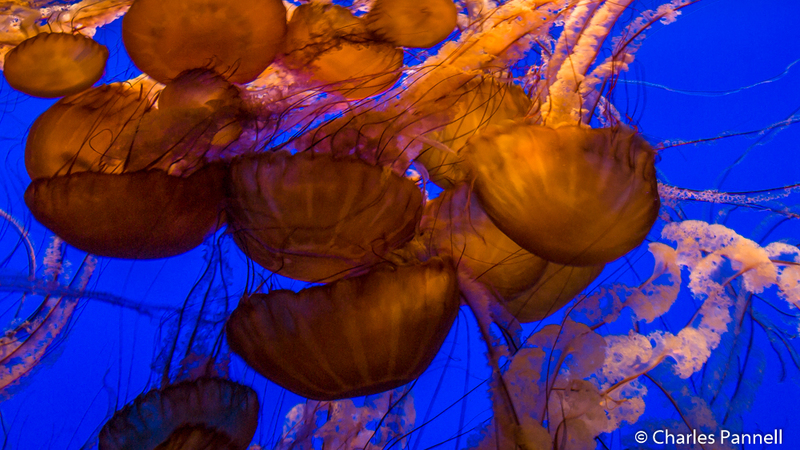 Plus, it will give you even more time to enjoy all that the Monterey Bay Aquarium has to offer.